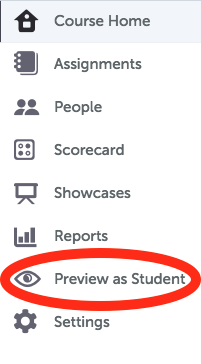 You may preview how your course and its assignments will appear by clicking the Preview As Student button. If an assignment’s start date is in the future, this preview mode will acknowledge the existence of the assignments. Actual students will not see the assignment. You will not be able to actually upload and submit homework for review and grading.